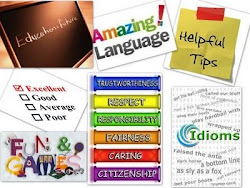 English Teaching Zone: 14 commandments for a enjoyable grammar class!!!!! 14 commandments for a enjoyable grammar class!!!!! 1) the teacher should really know the grammar point and, more importantly, WHEN and WHERE that grammar point is used in real life. 2) Before introducing the grammar point, build schema. Show the grammar in use, DO NOT tell. 3) Give examples from authentic information. 4) Keep it simple, then expand. 5) Students do not need to know everything at once , one step at a time. 6) Show the grammar point from different student's angles. 7) Students often acquire language and language patterns faster when interacting. 8) Alternate having students practice the grammar point actively and passively. 9) NEVER lecture about grammar rules unless you are teaching Linguistics. 10) Avoid giving answers unless no student can answer or figure it out. 11) Let students discover, show, discuss, compare, self-correct, error correct! 12) Avoid editting students' speech. 13) Make sure everything you use is real, relevant and in a context that is meaningful. 14) Be kind when you correct a student and double check if it is really necessary.